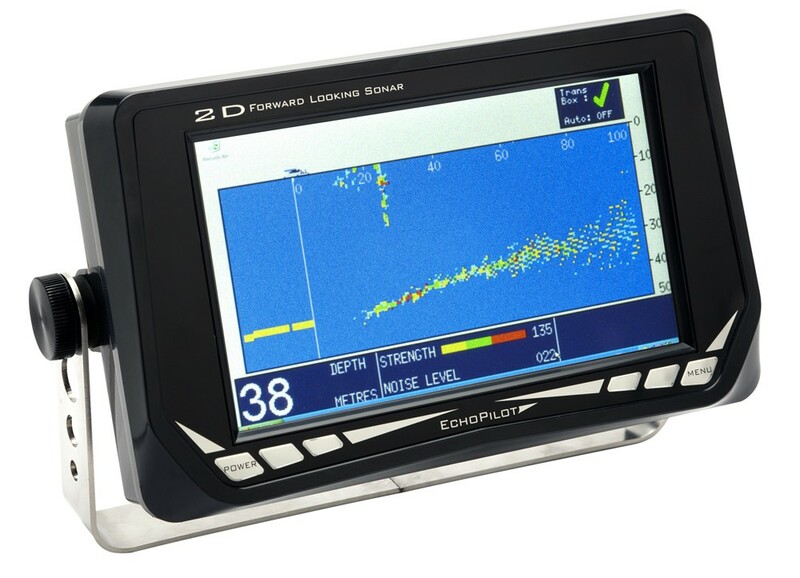 The EchoPilot 2D Forward Looking Sonar offers all the best features of the EchoPilot forward looking sonar displayed on a full color, 7 inch TFT LCD display. The benefits of color, apart from just being visually more pleasing, include being able to gain much more information about the nature of the seabed. Stronger echos produce colors at the red end of the spectrum where as weaker echos are at the blue end of the spectrum. This gives the user more information about the nature of the seabed. Stronger echos will result from a hard seabed such as rock. Weak echos will be received from softer materials such as sand or mud. Different fields or types of information are shown in contrasting colors, enabling the navigator to assimilate information much faster. Simple digital sounders show historical data, they may show a depth which is 10 to 15 seconds out of date. If moving at speed this depth could easily be hundreds of meters behind you. The digital depth on the EchoPilot 2D is an average of the first one third of the screen ahead, updated twice every second for true real time information. If you are moving this gives you a far more accurate representation of what is actually beneath your boat right now. The FLS 2D comes in three variations: The FLS 2D Standard, the FLS 2D Professional and the FLS 2D Repeater. The FLS 2D Standard come with EchoPilot’s standard through hull transducer and the FLS 2D Professional comes with EchoPilot’s Professional through hull transducer. The professional transducer has a bronze through hull housing with 3 inches of usable thread, and requires a 2.37 inch diameter mounting hole. 2m transducer cable is standard, with 10m extension cable. The transducer must be mounted vertically. The FLS 2D repeater gives you the option for multiple FLS 2D Displays if more than one display is required.